Integrated operator guidance for knife changes. Memory capacity of 1,998 programs (unlimited with ESPV Compucut). The BAUM Cut “P” series programmable cutters are efficient, compact, and easy to operate, with minimal maintenance. 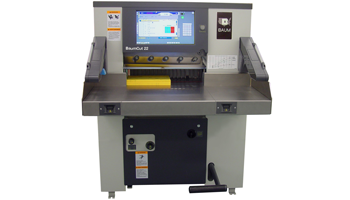 The Baum “P” series heavy-duty, fully-hydraulic paper cutters features a large 18.5″ touch screen color display. By Adding the optional “Compucut with the P-Net connect feature”, the “P” series BAUM Cut can be integrated into your digital workflow process. This allows you to send the cutting data directly from pre-press into Compucut as a PPF or JDF file. Compucut then automatically generates the cutting program eliminating the need to manually input the information. This saves you time and reduces errors. This optional feature can be added at any time to your BAUM Cut “P” series cutter. You also have the ability to purchase the “P” series cutter with a Bar Code Reader option which includes the “Compucut with the P-Net Connect” option plus the bar code reader. The Bar Code Option must be installed at the factory at the time the cutter is manufactured. The BAUM Cut offers high-productivity precision cutting with maximum safety in mind. Infrared safety beams, two-hand timed cut release and covered rear table help ensure operator safety.